This year marked the 74th annual Christmas concerts of the Virginia Glee Club. Started during wartime in 1941 by Glee Club conductor Harry Rogers Pratt and continued through to the present day without interruption, this concert series has been the longest running musical tradition at the University of Virginia. I thought I’d look back and see what we know about these concerts and their evolution. 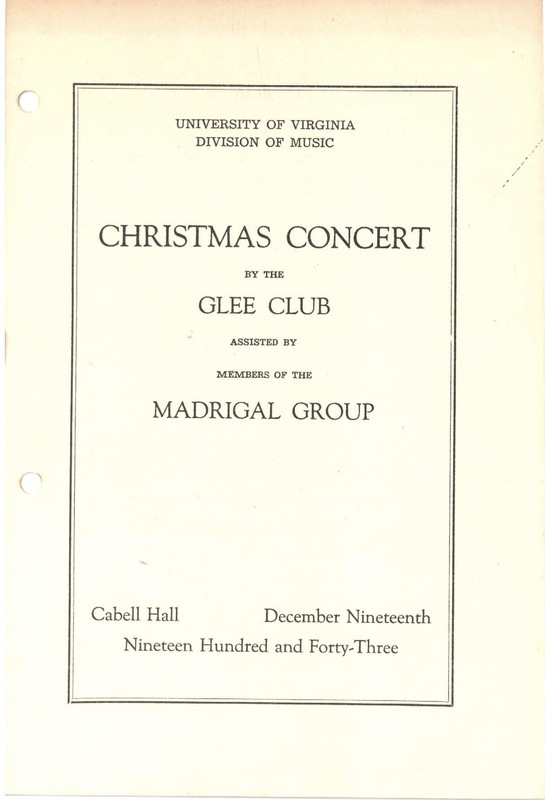 The first Glee Club Christmas concert was held in 1941 under the direction of Harry Rogers Pratt. We don’t have any documentary evidence of this concert; somehow no one associated with the University saved the program, at least not that we’ve found. But we have a College Topics (forerunner of the Cavalier Daily) article documenting the existence of the second concert, in 1942. The concert was to include a procession down the Lawn, “several Wassail songs,” and an audience singalong. The 1942 concert was Pratt’s last performance as Glee Club director; he resigned the following spring to focus on war efforts. His successor, Stephen Tuttle, continued the tradition during wartime and arguably made the Glee Club Christmas concert what it is today, with a mix of audience carols, familiar and new holiday music, and interesting collaborations. We have the program from the 1943 concert, and it’s interesting reading. Arguably a little heavy on Holst and Bach, there are a few jewels among the items chosen, including a Tuttle arrangement of the Spanish carol “Hasten, Shepherds” that would show up performed by the Virginia Gentlemen in the 1967 Christmas performances. While composer and music department head Randall Thompson was accompanist for the performances, none of his works were programmed; that would change in years to come. We don’t have a program from 1944, but the performance is attested in College Topics, including a roster of the Madrigal Group (which included a few members who had sung in 1943). 1945 continues in much the same vein, including a performance of Randall Thompson’s Alleluia (first performed by the Glee Club in its fall concerts that year). The postwar years saw a massive swell of membership in the Glee Club, but the Christmas Concert formula remained remarkably stable, albeit with one major change, the departure of the Madrigal Group — there’s no attestation of the group’s existence after Christmas 1945 (save for a brief revival of the name in 1957). Over time, as Tuttle’s tenure in the directorship lengthened, his influence on the repertoire increased, with Renaissance composers like Orlando di Lasso and Josquin appearing alongside the customary Bach in 1947. This concert was also the oldest for which a recording survives, according to the UVA Special Collections library. In 1948, during Tuttle’s Harvard sabbatical, Henry Morgan stepped in and delivered a fine entry in the canon, with a program that differed in specifics (a new Peter Warlock carol, a new carol by Morgan himself) but overall fit the general formula that was by now well established. I don’t have the 1949 program in the Glee Club archives, but 1950 continued along the same track, with new carols (“How Still and Tiny,” a Polish carol, makes its first appearance this year) joining the well established English and French numbers. In the first ten years, the formula for the Virginia Glee Club Christmas Concert was well established: audience carols, familiar and unfamiliar tunes, larger works, guest groups, and lots of reflective holiday works. That you could take any of these programs from the first ten years and perform them without modification today suggests the longevity of the formula, and helps to drive home why these concerts became an annual tradition.